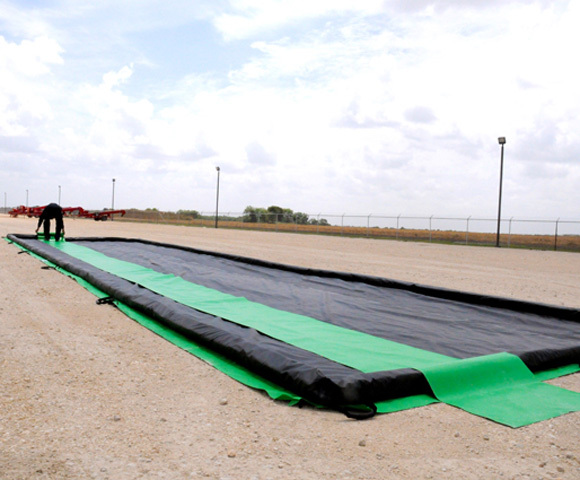 Air Wall Berms, also known as containment berm or spill berms, are drive-through berms that have been used for fast response and decontamination emergency response applications. With air walls that surround your entire containment area, these walls will easily bounce back after being driven over so your containment remains completely closed and connected at all times. The air wall containment berm is an easy way to stay in compliance with various EPA and secondary containment regulations. Made from your choice of either PVC or Urethane material, these berms offer a high compliance to chemicals, oil, and several other liquid materials. One of the best advantages to these berms is their ability to be easily transported to various locations around your facility. 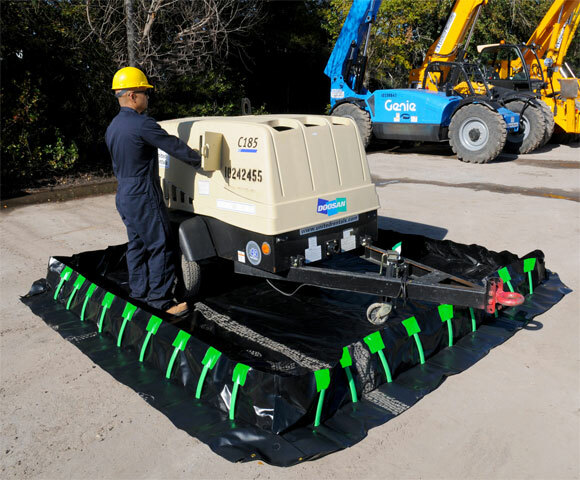 This not only provides an easy way for berms to be moved to needed locations, but also creates a fast response system for site spills and leaks. 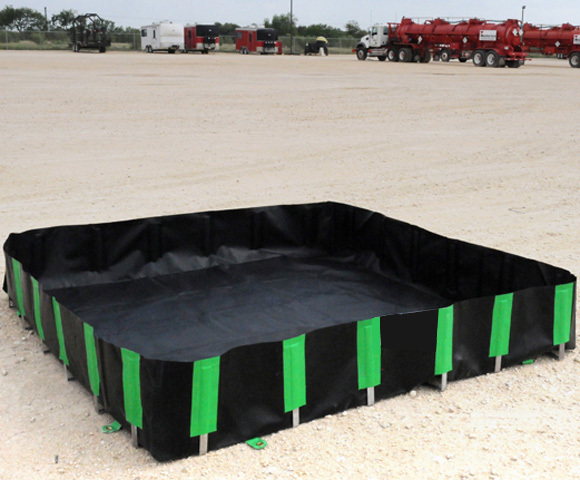 These secondary containment berms are easily transported when not in use and can be moved in vehicles and equipment such as storage bags, trucks, and various other transportation items. Alum. Angle & Foam End Berms: These berms feature air wall sides and foam wall ends. The foam wall is the perfect choice for drive through vehicles as it can easily bounce back after being driven over. Foam Wall Berms: Foam wall berms are a common choice for containment under vehicles, machinery, and more. These flat berms are easy to drive over and are perfect for catching leaks and spills. Aluminum Angle Spill Berms: These aluminum angle berms are designed to form a rigid containment structure around your stored materials. Entrance can be lowered to allow vehicles to drive in and out. Water Wall Berms: Water wall berms are made from the same durable liner materials but are filled with only water. This creates a wall of containment while still remaining incredibly easy to use and create. For further information on air wall berms or other secondary containment regulations, please check out regulations from the EPA.